Texas CEOs may be wondering what changes they can expect from the health care system in the near future. The answer may be a system that faces more utilization by patients, less supply of providers, and continued upward price pressures on private payors. In a recent white paper for the U.N. written by Vequist, McCallum, and Guiry (2012), the authors found that the literature supports that after the ACA is fully implemented, the U.S. system will possibly be burdened with longer wait times and less ease of access to care for many Americans. Models developed off of population estimates, forecasted numbers of suppliers, inpatient hospital beds and increased utilization of the system, based on similar international models, suggest these changes may begin to occur as early as year 2015. According to the Commonwealth Fund (2010), currently, on average, U.S. citizens experience some of the shortest wait times for non-emergency surgeries among industrialized countries. This compares to Canada that has reportedly long wait times for access to providers. Every year, the Fraser Institute, a prominent free-market think tank, publishes a survey of Canadian wait times and in the most recent report (2012) they found that, on average, patients have to wait 9.5 weeks between the time they see a specialist and the time they are able to receive care. Based on current models of the possible impact of ACA, the U.S. health care system could see increasing utilization and a decreasing numbers of providers, and therefore wait times similar to those found in Canada, in the near future. Another interesting unintended consequence of the ACA may be continuing price pressures on private payors and employers to make up for lower margin care provided by government programs. In an overview of the U.S. health care system from the employer perspective by Price Waterhouse Cooper (2011), they suggest costs for employers in 2012 will increase approximately 8.5 percent. Fleming, from a Health Affairs blog in 2011, suggested health care spending in the U.S. is projected to grow at an average annual rate of 5.8 percent through 2020 and the government share of all health care spending is expected to grow while the projected share for private business will decline. Along with significant cuts expected in programs such as Medicaid and Medicare kicking in over the next couple of years, it is expected that health care providers will be hoping that private insurers and employers can help balance these reimbursements to make them net positive. So, what kinds of strategies should Texas CEOs consider in order to reduce health care costs and increase their employee’s access to higher quality care? They may want to evaluate a medical travel option – one of the fastest growing trends in health care today. 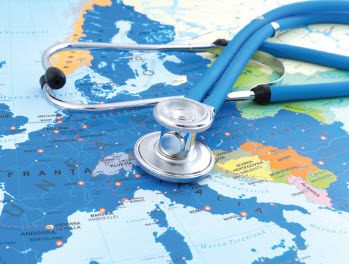 Medical travel or tourism, as it is commonly referred to, is the act of patients or employers searching for health care options outside of their local geographic area. This could include travel for health care to international destinations, which may be both controversial and politically difficult, or to domestic ‘centers of excellence’ which is also referred to as intraregional medical tourism. Typically, these patients and employers are searching for the best combination of access, cost, and quality. Centers of excellence typically can save an employer through providing employees higher quality care (therefore lower readmission rates) at a bundled price (transparency with no surprises) and take advantage of economies of scale and better, more mature processes. A medical travel option, which steers workers to facilities with high-quality care and lower prices, usually for very specific procedures, may, according to a 2010 Kaiser Health News article, reduce employer health care costs by 20 percent to 40 percent – more than enough to cover the travel expenses. In the U.S., as this article points out, hospital care accounts for more than one-third of the nation’s $2.5 trillion annual health spending tab. Employers using these domestic travel programs typically save money by negotiating a single rate with the facility, which includes the fees for surgeons, anesthesiologists and all medical care up until the patient is discharged. These ‘voluntary’ benefits usually also include the employer paying the employees’ typical co-payment amounts, possibly waiving deductibles, covering their travel as well as that of a spouse or family member, and even possibly providing a stipend for their time away from home. According to a MedCity Cleveland article from 2012, some employers that are currently using this option with the Cleveland Clinic are Lowe’s, Boeing, Kohl’s, Rich Products Corporation and Alliance Oil. In a 2012 American Medical News article, it was reported that all Pepsi Co’s U.S. employees will now have the option of traveling to Johns Hopkins hospital for cardiac and joint-replacement surgeries. In the Lowe’s case, the company negotiated flat-rate fees with the Cleveland Clinic for complex cardiac procedures. In one case, analyzed by the consulting firm Mercer, Lowe’s found that compared to the company’s standard insurance plan, an employee receiving care at the Cleveland Clinic would save the home improvement retailer over $60,000, even after travel expenses! Finally, in May of this year, Osceola County in Florida introduced a medical travel health plan for its employees that offer them an incentive to use an extended network of less-expensive overseas doctors and hospitals in countries such as India, Singapore and Turkey. This new benefit will cover more than a dozen common elective procedures, including heart bypass, joint replacements, gastric procedures and hysterectomies. So far, most of these strategies have been undertaken by larger self-funded companies. But, in the near future, the authors expect that more companies, including small and medium sized businesses, will choose to take advantage of medical travel options that will be made available to these employers through insurance plans, brokers, TPAs and third party hospital networks which will include both international and domestic centers of excellence. Wal-Mart, the nation’s largest employer, just announced they will offer insured employees no-cost heart and spine surgeries at Scott & White Memorial in Temple, Texas, and seven other hospitals around the country.